Encompassing the south shore of Burrard Inlet, Moody Centre is a neighbourhood where old meets new. Many heritage buildings can be found in this area, as it was the centre of Port Moody back in the day. Port Moody encourages the preservation of heritage character homes, so commercial re-use of existing residential buildings can be found in this neighbourhood including the old City Hall that was built in 1914 which is now the Port Moody Arts Centre. These historical buildings help maintain Moody Centre’s charm. Light Industrial Area: is largely made up of small manufacturers and distributors and is primarily located on Murray and Spring Streets. Commercial Area: St. Johns Street is primarily commercial filled with shops, services and restaurants. Clarke Street also has commercial space with many being housed in character homes. Both streets lead to Barnet Highway, which is the gateway via Burnaby to Vancouver. Rocky Point Park: Acts as the major south shore access to the head of Inlet Park, which extends to Shoreline Park and Old Orchard Park on the City’s north shore. Many annual events are held in Rocky Point Park including the Golden Spike Days Festival held Canada Day Long Weekend and the Sunday Summer Concerts. Although Moody Centre has preserved its historical character, it is also the focus of much of the future development activity in the area due to the age of the existing housing stock, and the diversity of the neighbourhood from a land use perspective. Implementing transit-oriented development principles with respect to future transit stations to create a more compact, walkable community and reduce reliance on vehicles is necessary to cope with the regional growth. With the Port Moody Arts Centre and the Port Moody Station Museum located in this neighbourhood, there are many events to take in throughout the year that they organize including the Port Moody Festival of the Arts and the Easter Extravaganza respectively. One of the most historical events that happened in Port Moody was the Canadian Government’s decision to extend the Canadian Pacific Railway so British Columbia could join the Canadian Federation with the final western station to be built in Port Moody. By 1880, Port Moody was booming with railway construction. Hotels, stores and houses were also being built. Near the present marina on Barnet Highway, a wharf and railway station was built to accommodate supply ships arriving from Britain. The railway linking Canada from east-to-west was finally completed in 1885. The first ocean-to-ocean passenger train, Engine 371, left Montreal and arrived at the Port Moody terminus on July 4, 1886. Unfortunately, the boom was short-lived when the Canadian Pacific Railway Company built an additional line from Port Moody to Vancouver in 1887. The Port Moody terminus officially closed on September 25, 1976 when the CPR discontinued their passenger service. 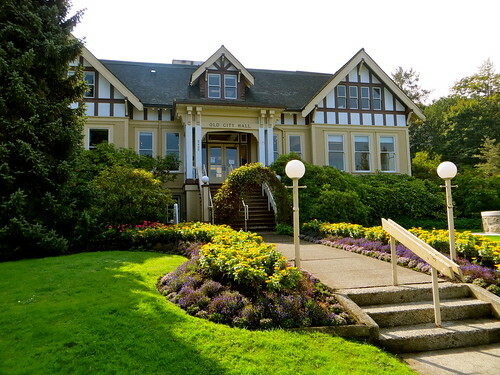 It was acquired by the Port Moody Heritage Society and moved in 1978 to its present location near the Moody Street overpass. It was refurbished and is presently the Port Moody Station Museum. One of the first European settlers to this area was John Murray. He was a Royal engineer (known as a sapper) who had travelled to Canada with Col. Richard Clement Moody (whom Port Moody is named after). At the end of their assignments, Col. R.C. Moody and his officers returned to England but any sapper who wanted to stay in Canada was given a grant of 150 acres. One of the sappers who stayed was John Murray who chose the present site of Rocky Point Park as his location, the nearby street now named after him (Murray Street). As Port Moody started to grow, John Murray wanted to get in on the action so he teamed up with a former ship captain by the name of James Clarke to sell lots to people that where being lured by the boom. John Murray’s son assisted with the land surveying and was asked to name the streets. Many of the streets in Moody Centre are aptly named after the Murray family. Moody Centre is considered a Heritage Conservation Area and a list of heritage properties of Moody Centre can be found on the Heritage Register. Emerson Cedar Mill was built west of the Moody Street overpass in 1905. It was later renamed to Flavelle Sawmill. It was known as the oldest industrial plant in Port Moody but due to soaring insurance costs in 2012, it was forced to close down. There have been talks to develop its waterfront property; a marina, a hotel and artist studios have been some of the suggestions. In 1960, Pacific Coast Terminals was built, also west of the Moody Street overpass. They receive sulphur and ethylene glyco from Alberta by train and then off-load these raw products, store them and then load ships to export them. PCT has made Port Moody one of the largest sulphur exporting ports in the world. West Coast Express – The West Coast Express is a commuter train that provides a quick, non-stop 25-minute train ride into Vancouver’s Waterfront Station during peak weekday hours. During non-peak hours, the WCE TrainBus provides service using highway coaches to supplement the regular rush hour service. The Port Moody Station is located approximately 200 metres (660 feet) north of St. Johns Street, down William Street. Evergreen Line – Rapid transit is on its way to Port Moody and one of the two stations for the Evergreen Line will be constructed in Moody Centre at the existing Port Moody Station used for the West Coast Express.